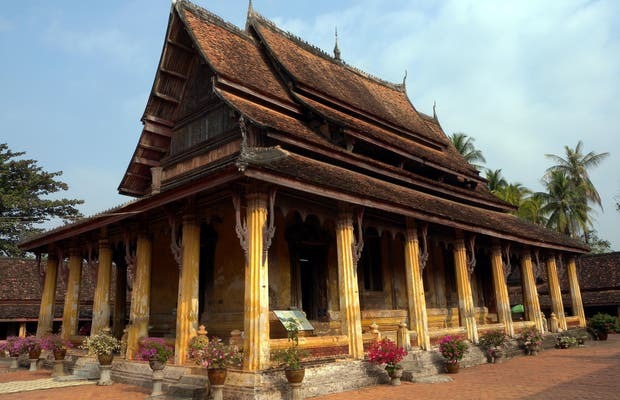 Wat Si Saket is a Buddhist temple in the capital of Laos, Vietnam. It was built in the nineteenth century, so is not very old and it has thousands of Buddha statues standing around the central patio. Some do not measure more than a few centimeters, and others are nearly two meters. They are older than the temple. Wat Si Saket survived the various wars that took place in Vietnam, as the invasion of Siam Siamese empire, which destroyed most of the city. What saved it was probably having a style similar to the Siamese Buddhist temples. The temple is located in a fairly modern location, with wide avenues, which you can reach from the old center by walking for about a half hour, though it is not recommended due to the humidity and heat.